Hair loss also known as alopecia is a common problem in men, women and children. The signs and symptoms of this condition vary and includes dandruff, scarring, circular patterns, skin lesions, etc. The male baldness or thinning usually occurs at the crown and the temples whereas in females the target area is frontal and parietal. There are many things that cause baldness. The typical baldness in men is the male pattern baldness (MPB).This has its roots in the genes. The other reasons of baldness in men and women are Infection, Drugs, Pregnancy, Shock or trauma, etc. However, localized hair loss can be caused due to a medical condition such as tumor or skin outgrowth. Also, an unhealthy scalp condition may cause a significant hair loss both in men and women. PRP is an abbreviation used for Platelet-rich plasma. As the name says it is the blood plasma that is rich in platelets. This plasma is rich in various growth factors and some other cytokines which stimulate the healing of soft tissues in our body. First developed in the year 1970, this treatment therapy is now widely being used excellently for Hair loss treatments. PRP Therapy for Hair loss has shown tremendous success in a very short time by delivering effective and natural results. Initial Phase: This is where the treatment starts and usually is bifurcated in 4 stages. Each stage has to be performed with a gap on minimum 1-4 weeks apart. Maintenance Phase: It is the re-treatment stage that needs to be performed after 1-3 months. Our blood is composed of Red blood cells, White blood cells, Platelets & Plasma. PRP is made from your blood supply. 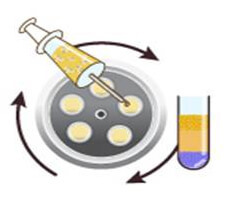 A little amount of blood is collected from the patient body and then placed in a centrifuge. Here the platelets and plasma separates from the Red Blood cells and white blood cells. The liquid prepared is now mix of plasma and platelet and called as PRP (Platelet Rich Plasma). Because of the two factors this liquid is rich in nutrients (plasma) & has a repair damage power (Platelet). 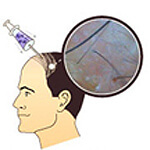 A minor injury is done to the scalp which activates the plasma and the nutrients to work for damage repair. Now with the help of a micro needle the PRP is injected to the affected area. The extra nutrients and the platelet present in the plasma hence act as a catalyst for the growth of the damaged hair follicles.